Fastnext Review 2019: Is Fastnext a Good Hosting? Fastnext offers features you won’t see on other hosts. They allow you to choose from Windows or Linus-based web hosting and offer a free 10GB CDN and cloud hosting for all plans. Fastnext is a U.S.-based web hosting provider that offers a variety of customizable hosting solutions. Whether you’re looking to start a blog, operate a webstore, or a network of websites, Fastnext offers suitable solutions for both Windows and Linux-based hosting. SSD drives are becoming the norm and are fives times faster than SATA drives that are typically used for web hosting. Also, you’ll have more than enough disk space for your website. Most plans start with a range of 5 to 25GB, which forces you to upgrade regardless of whether you need the other features of a higher plan. I really like the fact that this service offers both a CDN and cloud hosting. With a CDN standard, international visitors will view your site faster, and with cloud hosting, it’s unlikely your site will go down due to server problems your server and site data automatically migrates to another cloud server. Fastnext is remarkably easy to use with Plesk12 available for system administration for Windows hosting and cPanel access available for Linux-based hosting. Unfortunately, they don’t offer drag and drop or automatic setups for WordPress or other systems. However, they do offer free migration services. If you need to move a site from another domain, customer service will help you move it and configure your site for use on FastNext. This is standard on all accounts. One thing I do not like is the bandwidth cap on all services. It’s understandable that they have a cap on the Start plan, but a max of 250GB may become restrictive as your site grows in popularity, especially if you host streaming content. If you have any problems with your service, Fastnext offers multiple support options. You can start by checking out their knowledge base. However it is in Russian, so you will need to use Google Translate. Otherwise, you can contact customer support via telephone or live chat support. They are supposed to be 24/7, but my experience with live chat was a bit odd. While looking at the site, I was prompted with an auto-chat box asking if I needed help. I ignored it and went about my business. When I decided to click on the link offered in the contacts page for live support, it said that agents were not available. However, I was able to get someone in the auto-chat. It was clear they were non-native English speaking, and they recommended sending an email to support. 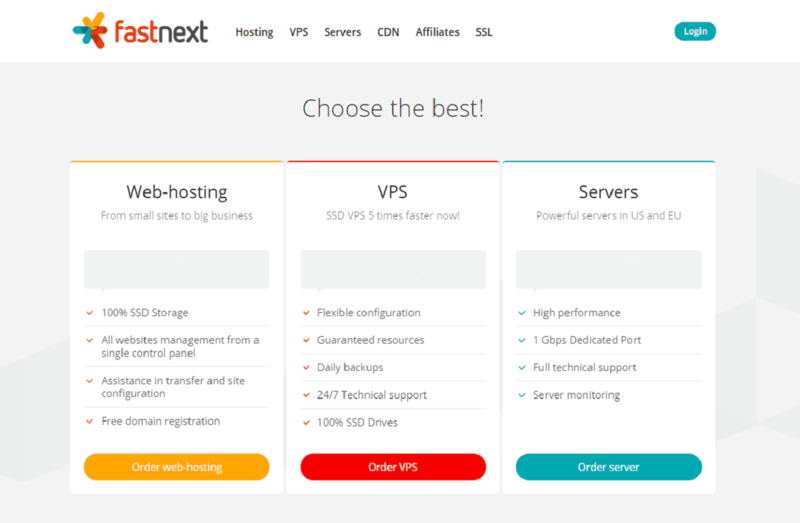 If you’re looking for low-cost, flexible web hosting, then check out Fastnext. Their hosting is up to five times faster than SATA based hosting, and you have the freedom to design and grow your site as you see fit. Wondering how Fastnext stacks up against other Web Hosting companies? Enter any other Web Hosting company and we will give you a side-by-side comparison.